Wildlife crossings are structures that have been designed to mitigate the effects of roads on wildlife using wildlife crossings such as overpasses, underpasses, and crosswalks. 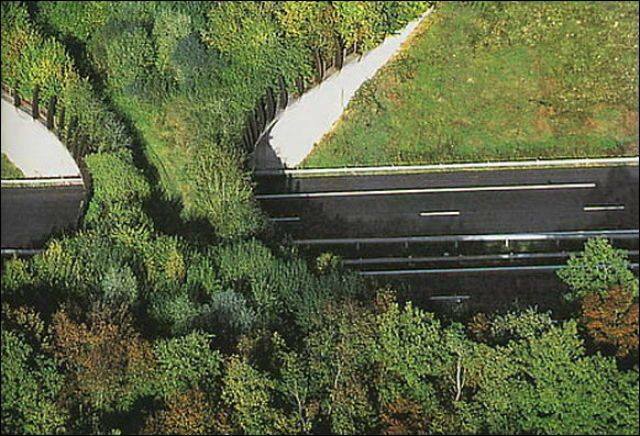 The first wildlife crossings were constructed in France during the 1950s. Since then, several European countries including the Netherlands, Switzerland, Germany, and France have been using various crossing structures to reduce the conflict between wildlife and roads. – Green roofs (for butterflies and birds). Rapid deforestation and excessive human intervention into wildlife habitat has lead to ongoing straying of wild animals into human habitation. Interference with wildlife habitat most often occurs due to illegal encroachment and also when roads, railroads, canals, electric power lines, and pipelines penetrate and divide wildlife habitat. Wild animals attempting to cross roads are often faced with oncoming speeding vehicles. To read more click <here>! Posted in Think Green!. Tagged Animal Crossing Bridges., Think Green!